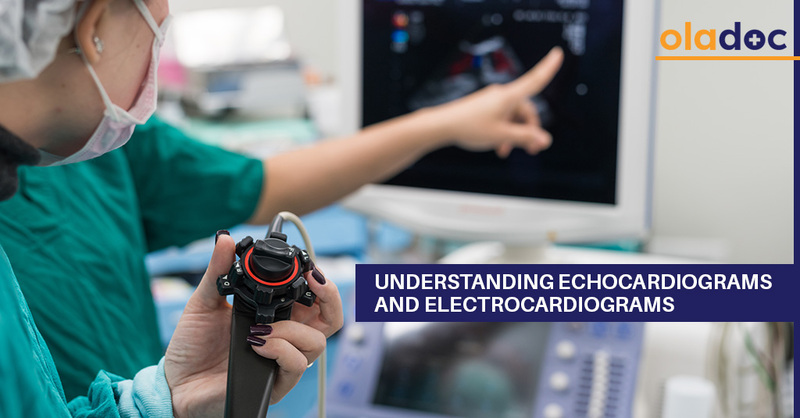 Also known as an Echo, Ultrasound Scan, or Sonar of the heart, an echocardiogram uses ultrasound waves to show accurate pictures of the heart’s structure and function. It is less commonly used than an EKG and is generally only performed when heart disease is suspected. While patients lie on their side on a special echocardiogram table, an ultrasound gel is applied to various areas of the chest. A wand-like ultrasound probe is then placed over the chest to send out sound waves into the heart, which echo back to form a clear picture on the connected screen. The entire procedure takes about 20 minutes: 5 for preparation and 15 for taking pictures, although it may take longer if more detailed visuals are required. In rare situations, patients may require a ‘Transesophageal Echocardiogram’ in which a thin flexible tube is inserted into the esophagus through the mouth. Identify leaky or tight heart valves (structures responsible for regulating blood flow from and into the heart). Detect abnormalities in blood flow, size, and shape of the heart as well as its pumping ability, especially in cancer patients. Detect the presence of blood clots and infections. Get a detailed view of the heart in case of abnormalities detected during an EKG (e.g. checking the extent of damage if a possible heart attack or artery/vein blockage is detected during an EKG). Unlike an Echo, and EKG/ECG records the heart’s electrical activity, and presents the pattern in the form of ‘waves’ on a graph. Its main function is to detect heart rhythm (beat) abnormalities. However, it is also a primary diagnostic test for patients with a heart condition and is also a part of the general physical exam to test overall heart health. Note:EKG and ECG are two names for the same procedure. ECG stands for Electrocardiography in English whereas EKC stands for Elektro-cardiographie in German. While lying on their back, 10-12 small sticky pads, or electrodes, are attached to various places on the chest. Connected to a digital EKG machine via connective wires, these electrodes record and transmit the electrical data to the machine, which then prints it out in the form of waves. The test in total takes only 5 minutes, although the tracing is generated in mere seconds. However, chest hair may need to be shaved for some men to ensure accurate readings. Holter Monitor: In some patients suspected with an abnormal heart rhythm, regular palpitations, or reduced blood flow to the heart, a portable version of the 12-lead EKG is attached and kept on for 2 consecutive days for observation. Patients can continue with their normal activities, except showering, while wearing the monitor. Event Monitor: Patients with occasional heart rhythm abnormality symptoms are fitted with a device which is activated by a button during an abnormal episode to record the heart’s electrical activity for a few minutes at a time. However, they may be required to wear the device for weeks or months depending upon their condition. Signal-Averaged Electrocardiogram: It is employed for detecting abnormalities in patients at high risk of arrhythmia (fast heartbeat), which can lead to a fatal cardiac arrest. Detect enlarged, thickened, or damaged heart chambers (parts), muscles, and tissues. Identify possible heart problems resulting from chemotherapy in cancer patients. Early detection can help prevent numerous heart conditions. Consult your doctor for a prompt and accurate diagnosis if you observe signs of any abnormal cardiac activity, especially when exercising, resting, or during any other physical activity.